Vee Mission Command 4.7 | Make it so? My first fatbike (Norco Bigfoot) came stock with Vee Mission tires. I rode them for a short period and then swapped out to a different tire as I was not really happy with their off road performance. I just did not find them grippy enough. After I embedded 120 Grip-Studs per tire they became the go to tire for icy terrain. Shortly after I studded the Missions, the Mission Command 4.0 hit the streets replacing its mediocre predecessor. 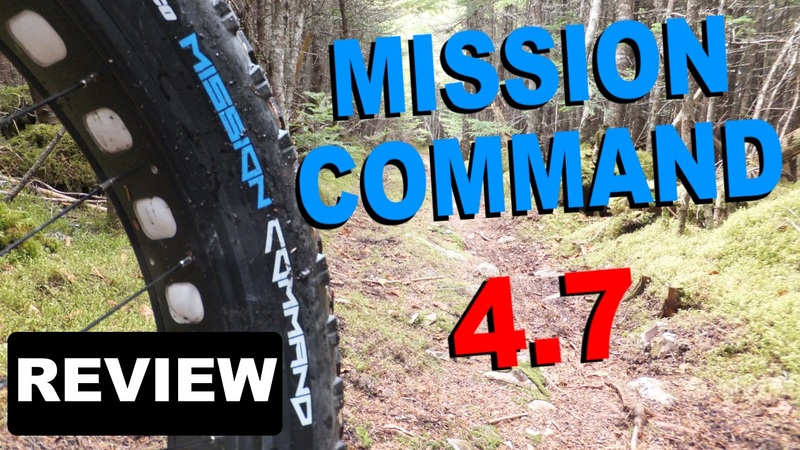 And more recently Vee Tire hit the "enlarge" button on the Mission Command offering the tire in a larger 4.7" size. Fatbike Republic was beamed a set of the 4.7's for testing . . . to boldy go where no fatbike has gone before. The Mission Command is available in three compounds: MPC (Multipurpose), Silica and the Pure Silica (White). Casings are available in both 72 and 120 TPI with a folding and wire bead option. According to Soongian tire technologists at Vee Tire . . . The MISSION COMMAND takes racing and trail riding to the next level. With the newly updated continuous center tread knobs, it's now the definition of a fast rolling, excellent control fat bike tire. This new pattern offers an extremely smooth ride with plenty of grip to spare. It’s innovative design makes it the fastest rolling Fat Bike tire in the world and the number one choice for OEM applications. Sizes include 20 x 4", 24 x 4", 26 x 4" and 26 x 4.7" with the 4" tires being available in a selection of colors. The tires sent for testing were the large 26 x 4.7 Silica, 120 TPI with a folding bead. Taking a closer look at the sidewall they are tubeless ready and directional. 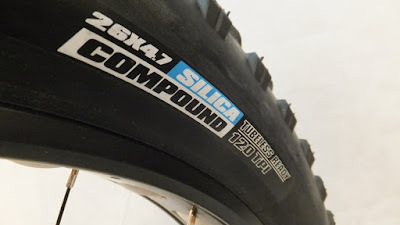 The Silica compound is the mid-range softness in the Vee fatbike tire line-up. 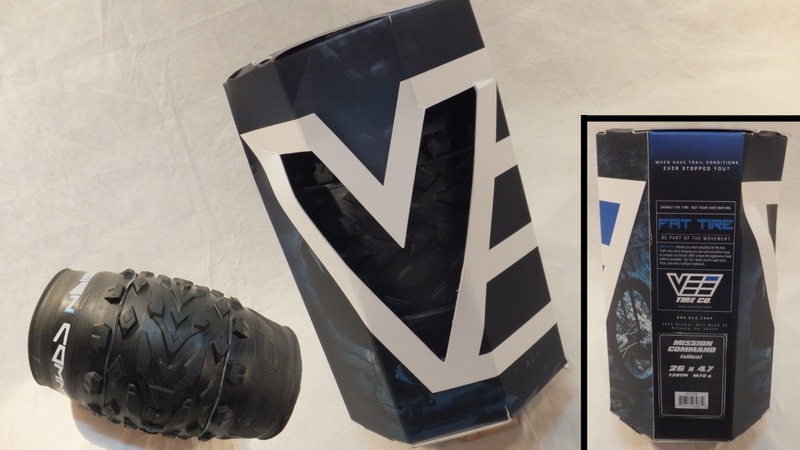 Vee says that technology taken from the automotive and motorcycle industry provides a rubber that maintains superior performance in colder conditions like in deep space. 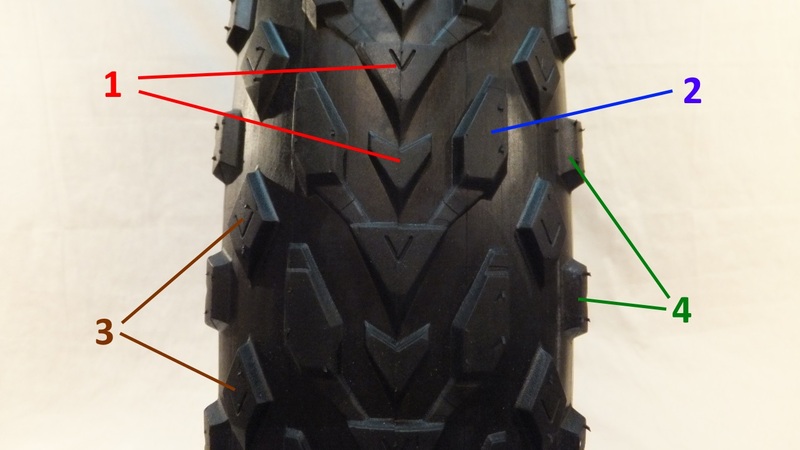 This tire has a tread pattern like no other in the Vee fattire family. Other tires tested have had substantial, aggressive, square edge lugs across the tire to provide traction. The Mission Command has a more subtle shallower tread pattern utilizing V and diamond shaped lugs. All the lugs (except for the shoulder) have long shallow slopes. Combined with the shallow tread depth the tire appears to be less aggressive in nature and more built for speed. As the tread depth is not overly deep 0.13" (center lug) to 0.18" (shoulder lug) the rubber appears to be contained in the tire carcass. You definitely will worry less about punctures and sidewall tears running this tire rather than a lightweight sub 900g fat tire. Putting the calipers on the tire (80mm rim at 8lbs) it measures in at 4.25" which is about 0.5" smaller than claimed. Mounted to a Norco Sasquatch the Mission Commands hit the trails for testing with a tire pressure of 10lbs fore and aft. A mixture hard packed, rocks, roots, mud and even pavement were thrown at these tires. Conditions alternated between wet and dry(ish). There was even a short excursion to the edge of the Neutral Zone. In dry and dry(ish) trail conditions these tire were quite predictable. They cornered well, had ample traction and liked to go fast. They also climbed relatively well on large rock faces and climbed their way over roots. When entering the realm of slippery\slimy conditions or where you may be searching for traction, the Mission Command is slightly out of its element. 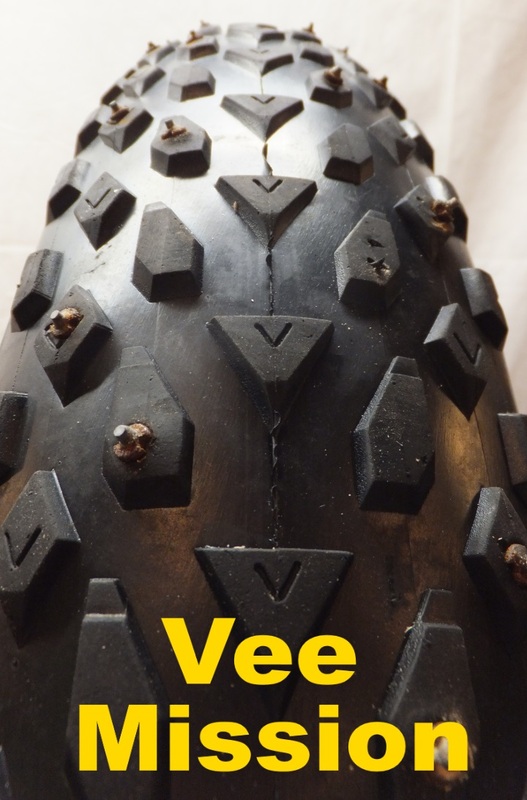 Vee Tire opted not to include square edged lugs for traction (such as on the Snowshoe XL) and instead equipped the Mission Command with "irregular" shaped long shallow ramped lugs for speed. This impacts the traction department in certain conditions. Surprisingly, the tires had less side to side slippage than anticipated. Although not tested in snow, I would not anticipate these tires being the first choice for hitting the white stuff. The Snowshoe XL would be a much better. Where the Mission Commands really shine is on hard packed trail conditions. With the shallow tread depth and long sloping leading edges on the lugs . . . these chunky donuts rolled extremely fast for a knobby 5" tire. They were also extremely quite on the pavement for such a large tire. You are not going to get warp like acceleration, however when moving these tires want to keep rolling. The Mission Command was designed for speed and is more at home in hard packed conditions where fighting for traction is less of a concern. This tire is not a fan of slippery mud and really loose terrain. Consequently, snow performance may not be stellar . . . however running the tire in reverse may engage the chevron pattern in the tire and increase traction. 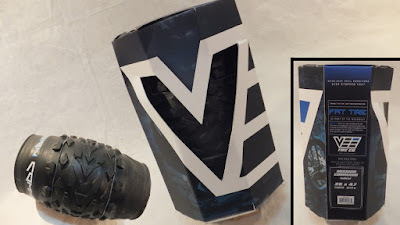 Although destructive testing was not performed, the heavy duty carcass of the Mission Command would appear to make it better suited for terrain where sharp pointy things are wanting to poke holes in the tire tread and sidewall. And if you happen to ride in more of a concrete jungle, the personality of the Mission Command could lend itself to be a decent 5" urban assault fatbike tire. Although the Mission Command may have limitations, the more you ride this tire the more it grows on you. 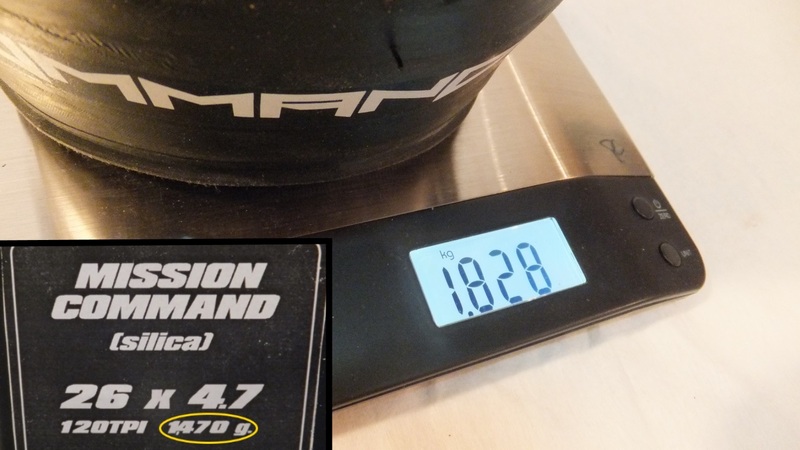 Although it may not make the short list for the best all-terrain and all-season tire in the star system, it does deserve some investigation when looking for a fast rolling 5" fatbike tire. How is this a 5" or even a 4.7" tire? Seems like 4.25"
I hear ya. 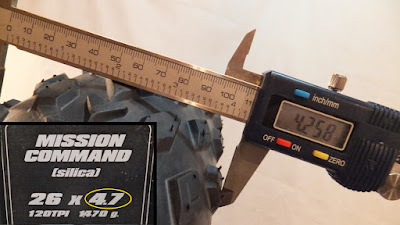 4.7 is on the sidewall, but as there is no real standard most tires that are >4" are categorized as 5".